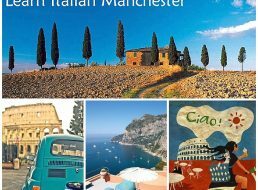 Home » Posts tagged "Italian classes in Manchester city centre"
Our new beginners Italian class will start on Mon 25th Feb 2019 at 6pm in Didsbury. Find out more about Italian classes Didsbury. Our new Mid-beginners Italian class will start on Weds 27th Feb 2019 at 6pm in Didsbury. Find out more about Italian classes Didsbury. Our Intermediate Italian classes are every Monday at 7pm in Didsbury, with a new class starting 7th Jan 2019. Find out more about Italian classes Didsbury. Our advanced Italian class in Didsbury runs every Wednesday at 7pm. Find out more about Italian classes Didsbury.